Wolf Lieser initiated the DAM Gallery (aka Digital Art Museum) project, which includes an online museum, an award in partnership with Kunsthalle Bremen, and a gallery in Berlin. His strategy is simple: integrate new media into the art world. Host Daniel Durning interviewed Lieser during the Moving Image Art Fair in New York in March 2016 where DAM presented Dark Storm Phials, created by boredomresearch—the collaboration between British artists Vicky Isley and Paul Smith. 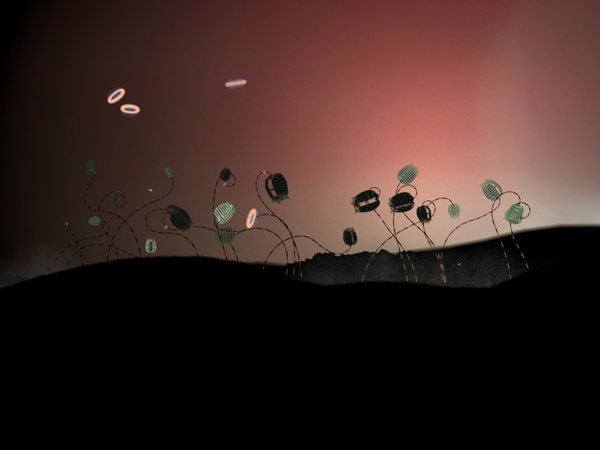 This artwork is a piece of generative software, in which thin, plant-like stalks grow endlessly on a dark, otherworldly terrain. Dark Storm Phials never repeats itself and can easily be played on a computer. The conversation also includes thoughtful observations on the monetization of digital art, the USB drive as a collectible, and digital multiples.